Beginning in 2019, SPACE is proud to be carrying on Ryder Farm’s legacy as an early adopter in the organic farming movement. Led by Director of Farming Jason McCartney and Farm Manager Doug DeCandia, SPACE’s farm team is dedicated to using natural methods that replenish the soil, protect pollinators and yield healthy and nutrient-rich food for SPACE’s residency kitchen and for the community. To learn more about the history of Ryder Farm, click here. Leer sobre Ryder Farm en español. CSA stands for Community Supported Agriculture. It is a collaborative and reciprocal relationship between farmers and their community: the CSA member purchases a share of the farmer’s harvest at the beginning of the season, providing resources at the beginning of the season when they are needed most. In return, the CSA member receives a weekly or bi-weekly share of fresh produce throughout the season. Unique to SPACE, members will also receive locally-grown art created by friends and alumni of SPACE’s artist residency programs. By signing up for a CSA membership, you will be helping to support one of the oldest organic farms on the East Coast and the larger mission of SPACE on Ryder Farm, while providing local, seasonal produce for you, your family and friends. You’ll also be joining a vibrant community that includes artists, farmers, neighbors and community members. SPACE is offering 90 CSA shares in 2019, for pickup at Ryder Farm or in NYC, and priced on a sliding scale to ensure memberships are accessible to everyone in our community. A CSA membership will be for 18 weeks, from June 5th - October 5th, 2019. You can also extend your membership through mid-November with the six-week Fall Add-On Share! You can choose to pick up your CSA share at Ryder Farm in Brewster or in New York City at the Union Square Greenmarket. SPACE will host a special “happy hour” pickup party for first pickup of each month at the farm, where you can mingle with fellow CSA members and SPACE’s resident artists! CSA members will also be able to sample farm-fresh recipes from the SPACE kitchen, all while picking out your weekly share of veggies. Farm Fresh Art: the first pickup of each month will include a sampling of artistic work created by friends and alumni of SPACE’s artist residency programs. SPACE is deeply committed to ensuring Ryder Farm is a source of inspiration and nourishment for everyone. 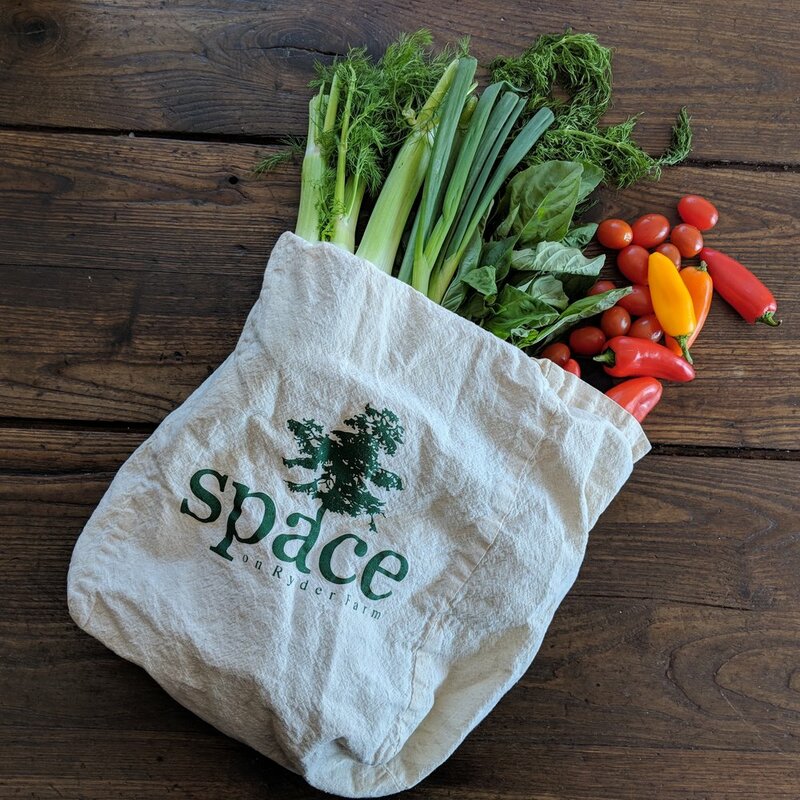 In that spirit, SPACE is offering sliding scale price options for each share size so that our CSA membership is accessible to all people in our community. A limited number of shares at each price point are available on a first-come first-served basis. Sign up now to confirm your share! To share the resources of our community most equitably, we ask that you please choose the pricing structure that most closely matches you and your family’s financial position. Please read these guidelines to help you assess which option is right for you. If you qualify for EBT benefits, please email or call SPACE’s Director of Operations, Allyson Davis, at allyson@spaceonryderfarm.org or (646) 833-8159 to discuss additional opportunities available to you. To join SPACE on Ryder Farm’s 2019 CSA, please fill out the online Membership Registration HERE. As our farm predecessor, Betsey Ryder, liked to say, we grow organic herbs and vegetables from A to Z. This season you can find everything from arugula to zucchini at Ryder Farm, and a lot more! During the season, produce can be purchased at the Union Square Greenmarket in NYC on Fridays or at our roadside farm stand on Starr Ridge Road in Brewster. Restaurants interested in wholesale orders may contact wholesale@spaceonryderfarm.org. She’d love to hear from you. Contact her at ryderfarmcottage@aol.com.